Allowing you to do more with short hair and face-framing fringes, the Mini Styler from ghd features slimline ½ inch floating plates that effortlessly glide through hair for quick, frizz-free styling and enhanced shine. 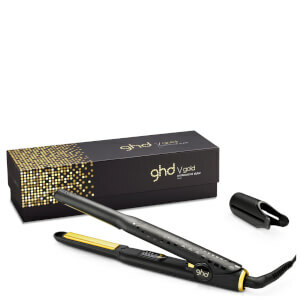 Boasting ceramic heat technology for even heat distribution at the optimal styling temperature of 185°C and a heat-up time of 30 seconds, the mini straighteners showcase a slender, contoured body with sleek gold accents and a round barrel to prevent snagging. Dimensions: Body Length: 263mm. Plate Length: 80mm. Plate Width: 12.5mm.